Rug?? - Can anyone answer where this rug is from please? I've seen a similar one used by Nate Berkus in katie Joel's NYC apt. Many thanks! Hi! Can you tell me what the wall color is? Also, where are the curtains from? I love them and I'm trying to recreate this look in our bedroom! Thank you! Hello! This question has been asked before, but we're happy to repeat the answer: The walls are Benjamin Moore "Tapestry Beige". Of course paint colors look very different in print and on-line, and can also vary from room to room depending on lighting and what other colors are present. We always buy a quart and paint very large swatches on at least two walls, and then check the look in daylight and in the evening. The silk taffeta drapery is custom made. We no longer have access to the source for the fabric. wall color - This room is beautiful! Can you please tell me the wall and trim colors? Thank you so much! Thanks so much! That is a great, idea, to paint large swatches, etc. I have painted an entire room thinking the color would change when it dried, only to find out that it was WORSE than I thought. Where to find White lounge chair - My husband and I have seen this project in a Boston Design Magazine which did not have a resource for that beautiful white chair. Who makes this? Thank you!!!! Thank you for responding, however I have found the chair/ottoman: It is by Reinhold Adolf. Hello: I'm afraid you'd need some kind of time travelling machine! That medallion has been in place since about 1840. Sorry we can't be more helpful. Valspar's Angel Touch is a similar color. Hello: The actual color used here is Benjamin Moore "Tapestry Beige, 975". Remember to always buy and test large samples of any paint color in the room where you intend to use it. Colors can look dramatically different depending on other finishes and lighting conditions. The ceiling is simply Benjamin Moore Ceiling White. It's a good reminder that picking paint colors from photographs is risky business! We always paint very large samples on at least two walls before committing to a color selection - even with colors we've used successfully on previous projects. Color changes with the light that hits it, and that varies with time of day, time of year, compass direction, and what else is outside the window. Gorgeous home throughout! - I just wanted to comment on the entire project... Stunning! I especially love the color palette you used throughout the home. Neutral but in no way boring! Thanks for posting the paint colors!! Hello! Thank you for the kind words. Beautiful! Does the wall paint color have some green to it? Hello: Green is in the eye of the beholder. And color is highly dependent on the surroundings - what's in the room and what's being reflected outside the windows. We always paint sample very large sample swatches in two locations in the room and check the perception of the color in both daytime and evening. The paint here is Benjamin Moore "Tapestry Beige". Crystal chandelier - We can provide this chandelier for you. It will be made just for you. Contact me if you are interested. Hello: We're not really sure what you are asking about this chandelier, but if you can be more specific, we will try to be helpful. Hello: The rug is custom wool and silk from Steven King Carpets in Boston. There is no specific model or make. Beautiful design! Window treatment information? - I love the window treatment, can you share the material and color (looks apricot?) or where you were able to purchase? Thank you so much and again, stunning design. Hello! The drapery here had been in another room of the house for years - we repurposed it here, but we don't have any source information. Sorry we can't be more helpful. Hello! The fireplace and its mantle have been in this house since it was built in the 1840s. Mirror - Would love to know where mirror was purchased? Hello: Mantle mirrors like this were customary in 19th c. Back Bay houses. This one, while not original to this house, came from a house a few blocks away. It was re-gilded locally. You can find similar mirrors at 1stdibbs.com or good antiques stores around Boston. I really like the coffee table duo? Where can I purchase them? Hello! Those really are great tables! Each one swivels so you can make any number of configurations. They are called "Ovo", from Arketipo. You can buy them through Casa Design in Boston, www.casadesignboston.com. Who made the sofa and chaise? Hello! The white leather lounge is called "Sinus" from the manufacturer "Cor". The sofas are B&B Italia, "Charles". So I am saying that mixing is a good thing, right? Absolutely — and not just in style. Consider mixing your metal finishes, too. This room, although done in a neutral palette, has great interest because of its mixed metals. 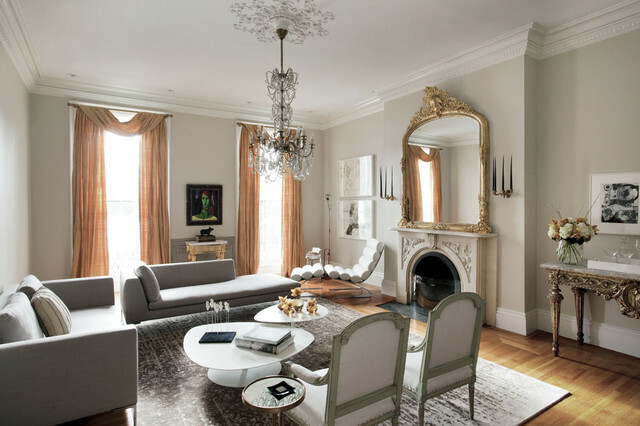 The opulent gilded mirror over the mantel has a different finish than the equally ornate console, and the chandelier boasts yet another tone, as does the circular side table and the legs on the contemporary upholstered pieces. Try this exercise: In your mind's eye, change all those pieces to the same finish. Can you feel what happens to this room? So here's a good rule: Mix your metals.See how to mix metal finishes in the kitchen and bathroom. For those of you who like the idea of a ceiling medallion but just want a light accent — because you have other amazing architectural detail in the room, such as this fireplace (and the mirror above it), or you just want to keep things simple — search for a filigreed medallion. Another consideration when purchasing a ceiling medallion is logistics. Most medallions come as either one piece or two (cut down the middle). One piece lets you avoid having to adhere the two halves together over your head. Two pieces work well when it’s a very large medallion or when removing the current lighting fixture is not a viable option. Once the medallion is installed with the proper adhesive, you’ll need to paint it to match your ceiling (or not, depending on your taste). The center of the medallion is usually cut open to accommodate the light fixture’s ceiling canopy. When purchasing a medallion, make sure the opening fits the canopy on your light. … and the pieces of furniture he would use. (I was going for exactly what he wanted: eclectic, warm and contemporary, with soft accents.) Because I was working in a furniture store, I had all the accessories — lamps, artwork, throws — set up in a room so he could instantly feel how the rooms would look. And throughout the process, I carefully repeated back to him the phrases he had used with me. He was very quiet as he listened and looked, which was a bit disconcerting because I try to “close” the sale as I go, rather than wait for affirmation at the end. But when I finished, he rather abruptly said that he had to think it over, and walked out.I was astounded and flummoxed. And peeved! After all, I had a 99 percent close rate on my presentations, and almost nobody left without buying at least a portion of what I presented.